The Real Polar Wrap combines hi-tech performance with super softness and comfort. 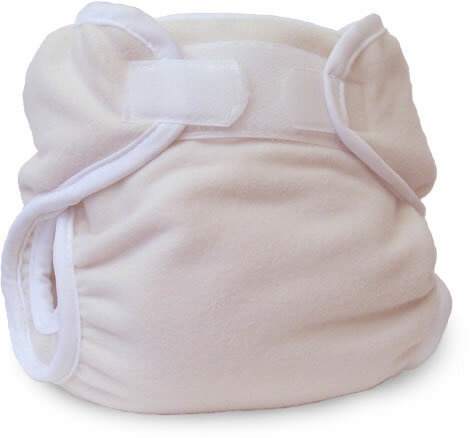 Two layers of breathable fleece with a highly breathable laminate sandwiched inside - this nappy cover is the ultimate in comfortable baby wear. Never too hot - use it all year ‘round. It is a truly amazing new age textile. This is a densely knitted but lightweight, anti-pill fleece that will wick moisture away from baby’s skin while the interior waterproof laminate prevents any moisture from leaking onto clothing. The Real Polar Wrap features a totally new design with leg gussets! Soft and stretchy lycra bindings on the gusset hold absolutely everything in, but won’t leave red marks on baby’s sensitive skin. The Real Polar Wrap will fit with any type of nappy! Super trim and not bulky at all – this is a fleece cover that will fit beautifully under baby’s clothes. Easy care – can be washed and dried with your nappies. All the great quality you would expect from a Bummis product. Foldback Aplix tabs for washing, stretchy elastic with smooth polyester binding to protect sensitive skin, high quality components, and total attention to detail. Click the button below to add the Polar Wrap to your wish list.